American Idol had a special moment (cue the Full House music) last night. They’ve been talking about a special announcement all season. What’s the announcement? Well, they’ll be raising money for poor people in Africa and New Orleans. On April 24th and April 25th America Idol will have a theme, “Inspirational Songs.” For every vote that is cast, American Idol sponsors will make a donation. Quincy Jones will be writing a special song for this event. Oh, and they said Borat will be stopping by as well. Yeah, way to make it “serious.” Poverty isn’t funny you jackasses. Oh wait, ok well it is a little. Who else will be stopping by? Why Gwen Stefani, Pink, Josh Groban, and Bono of course. 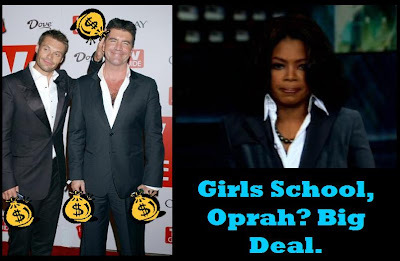 Ohhhhh Oprah is going to be pissed! Ok so that is nice what they’re doing, but I couldn’t help but to find a little humor when they were showing the clips of Simon and Ryan’s trip to Africa. It was kinda like a honeymoon for those two. Very sweet. Anyway, they then cue Paula Abdul talking about how great it’s going to be to, “put smiles back on these kids faces who haven’t been able to smile in a long time.” Literally, as she’s saying this all they are showing are the kids of Africa smiling. I was thinking that they already look pretty happy to me. One of the kids even had a “grill” in their mouth. No joke. Two silver-front teeth. I was like, wow is that poor kid crunk?